I used 9 colors and tried to achieve an ombre effect. The size is about three times larger than the chunky basket. I'm putting this one beside my chair for WIPs. If you are using one color to make this basket, you will not need to join each rnd of the body of the basket. Continue working sc in a continuous spiral eliminating the seam. You will work two rows of each of the colors except for the bottom and the last three rounds. Rnd 10: Ch 1, sc under the line or ridge on the back of the first st of previous round. (Hdc have a line or ridge on the back of the stitch). You will be working under this line or ridge, not into the regular loops. creating a seam separating the bottom and the sides of the basket. Continue working sc around. Join with sl st.
Rnd 11: Ch 1, sc in same st and each st around. Join and finish off. Rnd 12: With dark grey, sc in each st around. Join. Rnd 13: Sc in each st around. Join and finish off. Rnd 14-25: Repeat rounds 12-13. Rnd 26: With mustard yellow (or the last color of choice), sc in each st around. Join. Rnd 27: Sc in next 13 sts, ch 10, skip next 10 sts, sc in next 26 sts, ch 10, skip next 10 sts, sc in next 13 sts. Join. Rnd 28: Sc in next 13 sts, 12 sc under the ch 10 sp. Sc in next 26 sts, 12 sc under the ch 10 sp, sc in next 13 sts. Join and finish off. I'm sorry I did not post this pattern earlier....I got the job and today was my first day:D I really hope working will not affect my blogging:D But I am really happy to be working again. I'm currently working on this pattern and I've made it to round 12 and mine is pretty floppy. Yours looks really sturdy! Is there a trick? I'm using Patons Classic Wool (maybe that's the issue?) in a medium weight with 4 strands. It's not a big deal, just that yours looks so awesome! Hey! I also make baskets and one trick you can do when your DONE is to starch them. Find a way to hold them up and spray with starch water and let sit. This firms them up and makes em sturdy. And if it wears out you can always do it again! Thanks for the starch idea! GREAT! Thanks for the pattern. I really want to make one soon! Congrats on the basket but a bigger congrats on the job!!!!! So happy for you and of course they hired you on the spot! This is so incredible!!! Love this so, I must make one. So lovely, congrats! I am so glad you posted the pattern!! I want to make this so bad!! Congratulations on the new job!!! Good for you!!!! Thanks for the pattern, going to start on it right away:) Congrats on the job! Thanks so much for the pattern! I've been wanting to make a yarn basket but haven't found any I liked enough to put the time in until now. Also, I love love love the colors you used. I have been looking for ages for a basket that I could keep in my living room for my yarn and haven't had any luck... I resorted to using an old Easter basket I found in storage... I will be making one of these soon! Probably in various shades of turquoise (I'm obsessed), navy blue, and grey. the colors in the basket are amazing! Thanks for sharing your pattern! Thanks for sharing!! and Congrats!!! Lovely, thanks so much for sharing the pattern! Great idea to use those colors. Congrats on the new job! You need to update your profile now, to say that you are again employed ;) Also I cannot wait to make one of these! Thank you for being generous with your talent. I can't design anything on my own, it seems, but love the patterns you have shared! Beautiful! Thanks for sharing your pattern and congrats on the new job!! Gorgeous coloring and flawless execution. Thank you so much for the pattern! Congratulations on your new job!! Will you please list the yarn type and colors for us when you get a chance please. I love this basket! I used a variety of worsted weight. Red Heart Super Saver in Black...I had a lot of it and wanted to get rid of it. It worked out well because since it is so stiff and scratchy, it makes the basket stiff and sturdy. Love the color combo, and thanks for taking the time to post instructions. Congratulations on the job news! Thank you so much and you're welcome. I used at least 2 skeins of black. The other colors I used maybe one skein. I held 4 strands together by balling up 3 and using the rest of the skein, and then holding the 4 strands...if that makes any sense. Sorry about that. I didn't explain myself very well. Since I was only working with one skein of each of the colors (except the black), I had to make 3 balls from the skein so I would have 4 strands to work with. I just estimated how much I would need for each ball. Since you are only working two rows per color, the balls will not have to be huge. Ah, I had never heard the term "ball up" before; I've always just said, "Roll into balls" -- learn something new every day! Thank you so much for posting your pattern. I will make one for a friend's Christmas present. Congratulations on getting the job! This is such a beautiful basket! 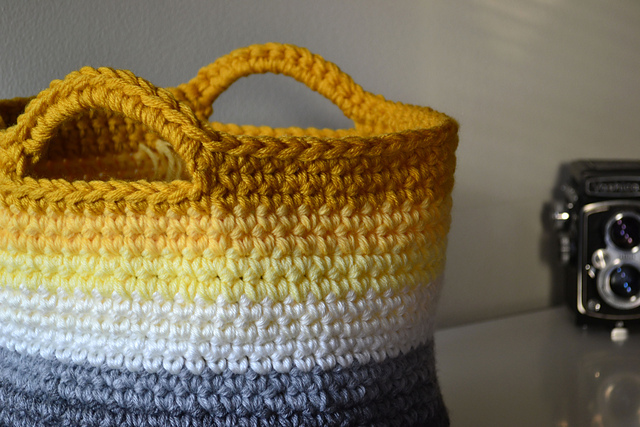 I ran across your ombre basket that someone had pinned on Pinterest which lead me to your blog. I love so many of your projects and patterns. Thank you very much for share your creative designs. I am definitely a fan and follower. Woweee, what a beautiful basket. I had to make reference to it on my blog. Thanks for your pattern. Beautiful colours too! WOw! Those colors are fantastic together! Congratulations with the result! I LOVE LOVE LOVE this basket and want to make one for myself!!! I downside to this is I cant read patterns and didnt know if you could make a video showing how you did it. I am a visual learner, reading patterns has always been a struggle :( Didnt know if you could????? If not then I didnt understand what you meany by when you said for example: " I had to make 3 balls from the skein so I would have 4 strands to work with." Thanks so much...I would love to help you out. Right now I just don't have time to make a video. Whenever you have a big skein and want to double or triple or quadruple it like I did here, all you have to do is make 3 balls from the one skein. You'll have the original skein end, then three separate ends to hold together, making 4 ends. Hope this helps. Beautiful! Can't wait to make this. I LOVE your color choices and the effect! I can't wait to make one! Here she is! This project was super fun and I will be making it again, probably using double-strand bulky to make a toy basket for my girls. FYI, I wondered how much yarn it would take so that I can make a couple of others in the near future. By my measurements, I used maybe 60 grams each of the five body colors I chose (various worsted acrylics), and probably twice that of the black for the bottom. I made 15-20 gram balls of each color, had some leftover, and had to add onto some. I'd love to make one for myself! This is gorgeous! But I don't understand what you mean by "hold 4 strands together"
Does that mean you cut each color to make 4 strands and that's how you crochet? I am sorry but I am a novice here. Thank you! Yes...it doesn't take a lot of each color. So, I just made a couple of balls from one skein. Then I held the ends of the balls together with both ends of the skein, making 4 strands. Hope this helps. This is simply put, gorgeous. Its in my favorite color scheme too. Im gonna make me one too. Thx! I received an e-mail from my daughter, with a link to this pattern, which usually means she wants me to make it for her! I have not been able to find a "L" hook. Can you help? I'm sure an N hook will work just fine, just make your stitches nice and tight. N hooks are easy to find. I think I'm going to add a couple rounds to the base for a larger basket. If I work in 3 more rounds, up to a 10hdc spacing... Could you help a novice adjust the spacing for the handles? I'm also using an "N" hook, working out fine. Me again (unknown = Ellen). I count 106 hdc if spacing is 10 hdc in between the 2 hdc? So, handle spacing? Believe it or not, I have a doctorate... Just NOT in crochet. My grandma is surely spinning in her grave. Question. When I've made bags before, I found they needed to be lined with fabric if I wanted to carry anything [like a couple books] in them. Is that true for this bag, or does knitting with four strands (I usually use one or two] help with this? Do you find that the handles stretch out? I'm trying to think if there would be a way to stick something in there to reinforce it, or if that's even necessary. l can certainly understand why this basket is popular... So handy & they look so trendy on benches, etc.. Best Wishes, Hahnsmum.. Australia.. I love this basket. Thank you so much for sharing. I am fairly new to crocheting and would like to try this, however I would like to try and make it slightly larger. Would I just increase the rounds in order to do this? Thanks so much and you're welcome. Yes you would just add an increase round or two on the bottom. Hope this helps. Thank you. I'm so glad you found me. I hope you find something here that you would like to create. About the camera...I use a Nikon D3100. Taking good photos all depend on lighting. Just use natural light and almost any camera will give you good results. I think it would be perfect made with plarn. It looks fantastic. I love it! Wow! Thank you so much for this pattern! I just stumbled on your website and cannot wait to pull out some yarn and get started on this! Your color choices for this bag are wonderful! 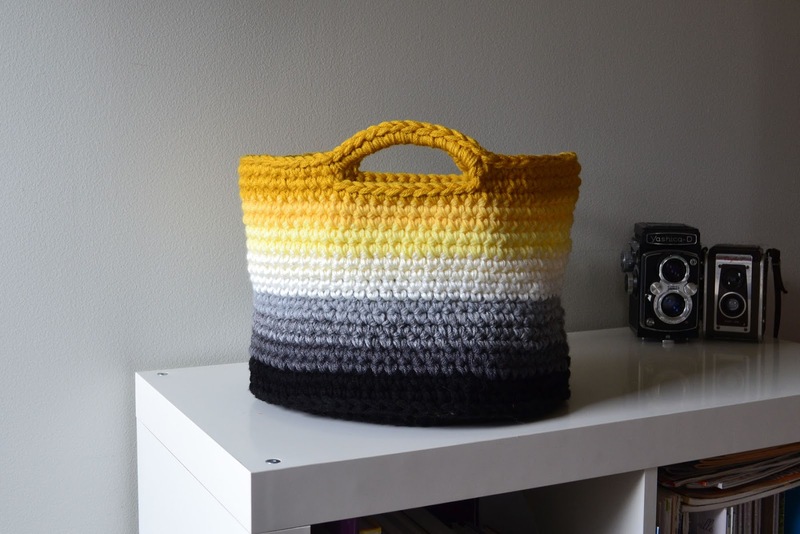 I have been wanting a project bag/basket - and this is going to be PERFECT! ;O) Thank you for your generosity in sharing!!!!! Do you hold 4 strands of yarn throughout the entire basket? I am having somechallengers and hoping you can help me. 1) the basket seems wobbly. Did you crochet tightly? 2) I can't seem to get the stripes to line up. Ever two rows looks like there's a step down to the same color... If you know what I mean. What am I doing wrong? 3) finally, would you explain where exactly to put the needle for the handles? I'm very confused. I love the color choices. Thanks for sharing the pattern. love it!so original and chic! Thanks for the pattern. I am a knitter and will have to look up what all the crochet stitches mean. You have to start somewhere! Hope it isn't too hard. You're welcome. It gets much easier after you learn the abbreviations. What brand of yarn do you use. Simply beautiful. I used a variety of what I had handy. Scroll up and check out the other post. I responded with the brands and weights. All were worsted weight, holding 4 strands together. I would recommend practicing another project first...that may be a little easier like a scarf or cowl, then try to follow this pattern. If you learn what the abbreviations mean, you can tackle pretty much anything. How do you make the handles thicker???? I would add a round of sc. Just play around with it and use sc or hdc. Check out the Chunky crochet basket two in the list of free patterns. I made the handles thicker for that one. I am totally in love! I think I am going to have to dust off my crochet hooks and take a refresher coarse. Just found this basket! So pretty! I'm having trouble at the very beginning fitting 7hdc into the third ch ... which is tecnically the first chain right? any suggestions or tips on something I'm not reading right?? Yeah technically the first chain. Don't forget that the base of this pattern is worked in the round, so start to turn (rotate) your work to fit in all 7 hdc's into that chain. You can push the hdc's you have done back a bit (squish them up) then spread them out when u are done with that round....or for the last couple of hdc's change to a smaller hook to pull them through the tight space. I'm just finishing my basket now! You're right. Make sure your chains are not too tight. That could be the problem. I make my slip knot by just twisting the yarn around the hook to get started, so my first chain is loose and open. I pull the beginning tail tight to close. I know that sounded confusing so just make sure your chains are loose enough. Thank you:D Nope...no clause of doom, feel free to do whatever you like with your finished projects. Sure, it's ok to mention. That would be an honor for me. Wow - popular post and I'm commenter no. 101! 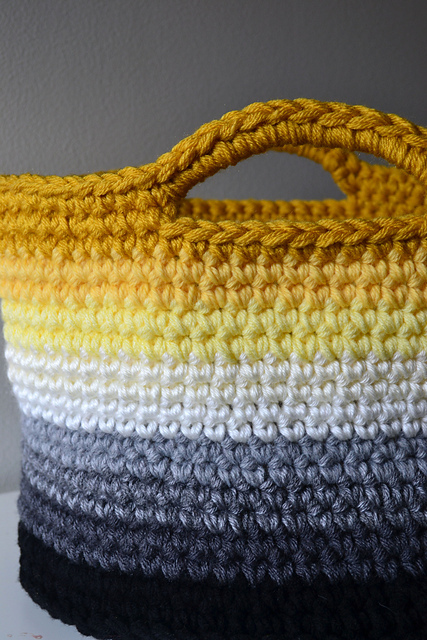 I love, love, love your basket - the ombre part and the crochet part makes it so beautiful! I have this linked to my crochet post too today, for inspiration! Just curious, but how much yarn did you end up using to complete the basket? I'm making one with stripes, not ombre, and I don't have 9 different colors :) Thanks! I don't know I used partial skeins...whatever I had in my stash from previous projects. I used 4 strands held together at one time. The yarn is scratchy acrylic which works great to stand up. 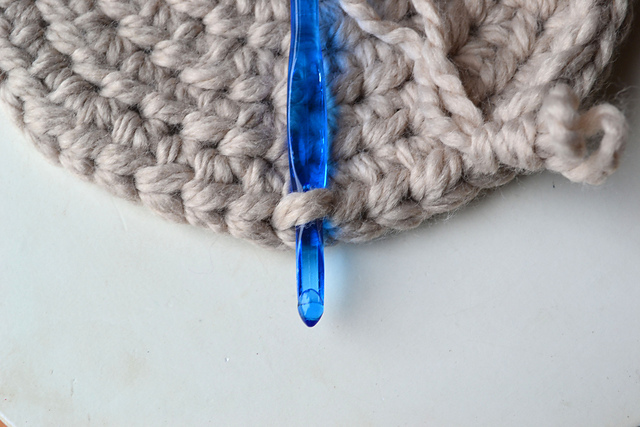 You will hold 4 strands together when crocheting. Thanks and let me know if I can help. I'M USING 1 STRING OF VANNA'S CHOICE AND 8.00MM CROCHET HOOK. HOW COME MY BOTTOM IS 7 INCH IN DIAMETER? PLEASE HELP!! You should be holding 4 strands together. Love what you have done here! Have you ever thought of doing video lessons? Sou brasileira amo trico, mas com a internet viajo muito pelas redes e aprendo também. Sempre fis crochê o básico mas tenho visto trabalhos tão lindos que resolvi me aventurar. Estou apaixonada pelo crochê tenho feito algumas coisa, e a chefe da minha filha me encomendou esta cesta para usar como bolsa de praia, vou faze la e posto a foto para você. Adorei seu trabalho é perfeito parabéns, obrigada por seu carinho e vontade de presentear seu próximo com o seu saber. "BOAS FESTAS" minha linda tudo de bom a você e aos seus. Parabéns pelo seu trabalho e muito sucesso. Do you think a tshirt yarn would work? Rather than holding multiple threads together? Beautiful work! Love the colors combination! Thanks so much for sharing! Would love to have you visit me sometime. amazing tutorial and such a lovely basket! congrats! If you don't want to make separate balls, just pull each end of each skein...that should be 4...if you are using 2 skeins. If not, if you have one skein of each color then make separate balls. It doesn't take a lot. I love this basket!! Thank you! I'm making my 5th basket right now and am using up as much of my scrap yarn as I can. It's been fun to make different sizes. Hello, I have started the basket from the pattern but I'm having difficulty getting the hook through all the loops of the hdc's. Any idea what I may be doing wrong? amazing basket!!! nice blog by the way! Thank you for the pattern to this beautiful basket!! I have a question though in the first part of the pattern it says 7 hdc in 3rd ch from hook. I use the a magic ring because it works better for me so I put 7 hdc in the magic ring and kept following the rest of the pattern but I don't get the same amount of hdc at the end of each round as the pattern says. Did you meant to say put 8 hdc in 3rd ch from hook? because I'm always off by one. The first two chains that you skip count as the first hdc so you would have 8 hdc. When doing magic ring you would make 8 hdc in the magic ring. 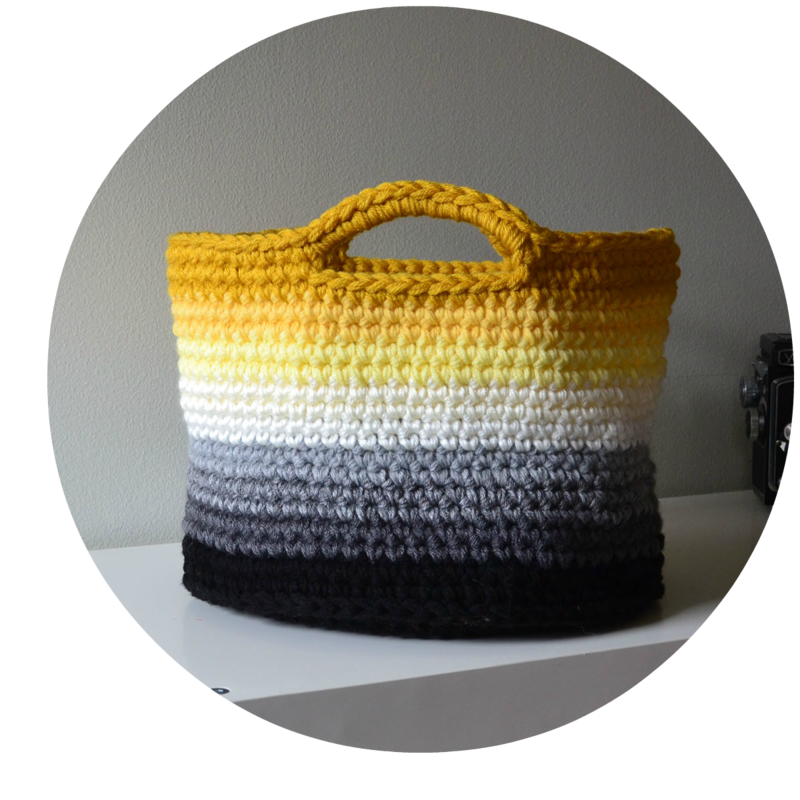 Anyone out there wishing to make me this bag in the yellow, black grey?????????? I love the colors! I made something similar a while back, but not out of wool, but out of an old T-shirt that I ripped up. They are so easy made! When crocheting bottom is is suppose to be kind of bowl shaped or flat? I used this pattern and posted the result on my blog and linked your webite! how do you do four strands together. I've crocheted before but don't understand this instruction. Thank you so much!!! I will try it!! I love your pattern and find it easily adaptable to different sizes and different types of yarn as long as your “principles” are followed!! I used 2 strands of Lion’s Hometown USA and a Size L hook. I ended my bottom at Round 5 (40 hdc and about 6” across) and then jumped to Round 10 for the transition round. I did 7 rounds of sc for sides of about 3.5” and then did the two rows for the handles. I decided to make my handle 10 chains, but skipped 6 sc because when I skipped an equal number to the chains it was too tight. To figure the spacing for the handles, I doubled the skipped sc (2 x 6=12) and subtracted 12 from 40 (28) and then divided 28 by 4=7. Handle round 1 would read: 7 sc, 10ch, skip 6, 14 sc, 10 ch, skip 6, 7sc. For the second round of the handle, it didn’t work for me to sc in the sc’s below the space, so I sc into the chains of the handle and it worked. Hope this helps those who want to make your baskets bigger or smaller! This basket is going to a friend recovering from surgery with a plant in it! I don’t know how to post a picture, but if you want to send me an email, I can attach it. Thanks again!! I just love this basket. 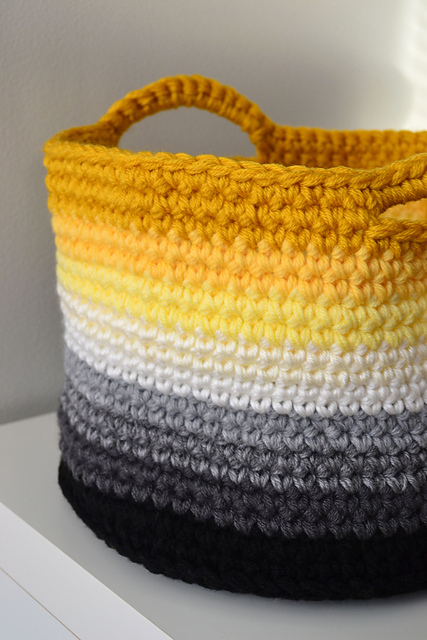 I haven't made it yet, but I hope that it's OK that I linked to in on my blog, as I needed an example of a beautiful basket pattern in my post for my not-so-beautiful crocheted basket! (You can see it here, if you might be interested -- http://oldsweetsong.blogspot.com/2014/02/for-love-of-old-t-shirts-crocheted.html) Thanks so much! This pattern is so pretty! About how much yarn did you need for each color, if you used four separate strands? Thanks for the pattern. I'm going to try this very soon. Has anyone made this with t shirt yarn? Thats all I have and I wanted to know if it would work for this or is it too thick? To Tiara, t shirt yarn should work wonderfully. I'm lucky enough to have double worsted cotton yarn at my disposal. I would need to use 2 strands to equal what the pattern calls for. T shirt yarn would be about the same, depending on how wide the strips were cut to. The worse that could happen is the size of the basket is different. I'm adding this to my ever growing lists of projects. Thanks for the reply. I need this basket to hold my growing collection of yarn! This awesome love it! Great for beach times !!! I did an image search for crocheted baskets and your beautiful basket popped off the page. You used the colors of my living room. I'll be making it in the next couple of weeks. I received my MSW in '97, at middle age, and worked in hospice which I loved. Thank you for your basket and generosity with the instructions. I'll be making one or two for my toddler grandchild, too. Thanks for choosing social work; I hope you enjoy your career. For round 2, do you chain 2 as the first HDC? I was wondering how you handled the thickness of the yarn. i'm using the red heart super saver in black and i feel like it i can barely make the stitches? Thank you for sharing, this is great, I've recently got into crocheting, I'm more of a knitter. I'm going to make this for my wool storage. Thanks again. How do you crochet "under the chain" for the handles? Hi, Liz! I love your basket and will try to make it in the future. I am new in crochet, so far I did a hat and a scarf. I have a question, what does "worsted weight" mean? Love love the pattern. I am going to put 4 skeins of different colors of green together. It is a gift for my friend for her birthday. Easy pattern. thanks for the free pattern. You are a treasure. Very beautiful basket. Can you please tell me which yarn are you used, because I couldn't find the same colors. How and were would I add stitches if I wanted my basket bigger? I just finished this basket and it came out awesome! I used an "M" crochet hook and 6 1/2 skeins of Loops and Threads Opus yarn from Michael's. Finished in an evening. Thank you so much! This bag is beautiful and I'm thrilled that you shared!! Wish me luck! Thanks for sharing!!! Are your instruction for U.K. Crochet or U.S. Crochet? is there a You Tube upload of this basket, please upload if you have. I'm kind of new to crocheting and I made your chunky basket. I'd say it turned out pretty well. But my seems always go crooked and just look kind of gross. Any tips to help me out? Just finished your basket. It's for a grandson to store a few toys in. I used cotton clothesline on the bottom part. It's a bit floppy but I love it. Thank you. Keep your home organized and looking good with these fun and uniquestorage bins that you can easily re-create! Olá! Adorei o seu trabalho! 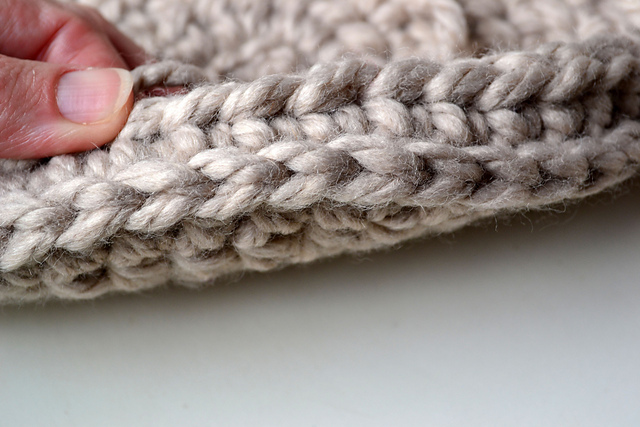 Desejo saber como fazer esse ponto de crochet. Thanks! I LOVE THIS! Thanks for sharing -- the color choice is awesome for Summer and Fall as a handbag. What brand of yarn did you use?! I Love the colours!! I just finished this and am very pleased with the results! To anyone who's concerned that their basket is round, rather than oval looking as in the pictures, the bottom is supposed to be round. It's when you grasp it by the handles that it takes on an oval shape. And for anyone confused about how to your yarns into 4 equal balls, try this: weigh your skein on a kitchen scale. Divide the weight by 4 - that'll be your target weight. Start rolling your first ball, weigh it, and when you get to the target weight, snip it off and start the next. Makes it so easy! I printed the pattern for future reference and found it lacking in clarity-not the pattern but the tiny print and light colouration of it. Is there a way of darkening the print? If you have any ideas please email me at srenaud508@gmail.com. Thank you. I am finishing this basket now and am unsure how to SC on the bottom of the handle. I am relatively new to crochet. Some friends and I are making this project together, bought our yarn and meeting in a few days. FUN. My confusion now is with the bottom. It is octagonal and not really round. All the increases being in the same place. Will it round out as you go up the sides? Thanks for the help. 5 years later and still a great pattern. Im working in rasta colors 4 strands of lily and cream and im loving the density!